Ceramic Fiber Rope is used for High Temperature Static Seals like door joint or gaskets for flanges. Fiberglass Square Braided Rope and braid are designed for various sealing and packing applications for up to 1000° F. Common applications include door seals or caulking material for ovens, furnaces, boilers, expansion joints. They can also be used as the core in tadpole gaskets. You can choose from our three different styles to best serve your application needs: Twisted Rope, Square Braid and Round Braid. 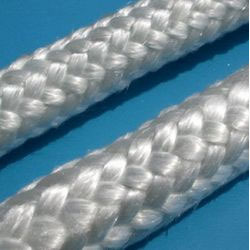 Twisted Rope is a soft rope, while square and round braid are more dense and solid. With immense experience and a competent team of professionals, we are able to offer an unparalleled range of Fiberglass Round Braided Rope. These products are developed utilizing premium grade raw material and latest technology in compliance with the industry laid norms and standards. Personnel appointed by us ensure to check the entire range on different specifications such as sizes, shapes and allied with respect to the diverse requirements of clients. 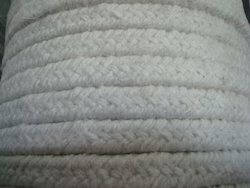 Ceramic Fiber Rope is used for Expansion Joint Packing. 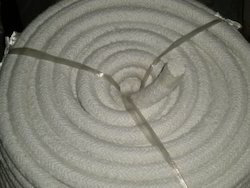 Ceramic fiber rope are dense, high performance packing fabricated from ceramic fiber yarn braided around a core of ceramic fiber rope either to form a packing in Round or Square section of desired sizes. 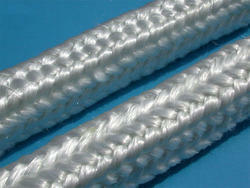 Looking for Braided Fiber Packing Ropes ?